Sandford Lock (Thames) Weir Exit is a minor waterways place minor waterways place place on the waterways major waterways place village town city on the River Thames (below Oxford) between Thames - Seacourt Stream Junction (Junction of the River Thames and the Seacourt Stream) (4 miles and 2 furlongs and 3 locks to the northwest) and Jubilee Junction (New junction between River Thames and the Wilts and Berks Canal) (4 miles and 6¾ furlongs and 1 lock to the southwest). 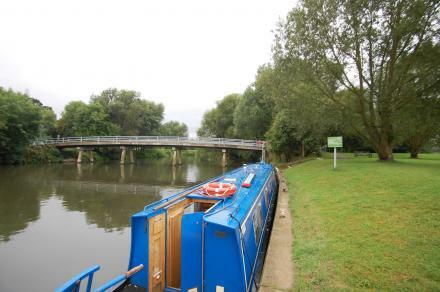 The nearest place in the direction of Thames - Seacourt Stream Junction is Sandford Lock (King&apos;s Arms pub); 1 furlong away. The nearest place in the direction of Jubilee Junction is Radley College Boat House; 1 mile and 4 furlongs away. Oxford Science Park, Oxford, OX4 4GA — 1393 yards to the northeast. Oxford, OX1 5RS — 1000 yards to the west. Sherard Building, Edmund Halley Road, Oxford, OX4 4DQ — 1356 yards to the northeast. Oxford, IV36 2 — 1517 yards to the north. Oxford — 1325 yards to the northwest. SAE Oxford, Littlemore Park, Armstrong Street, Oxford, OX44FY — 1323 yards to the northeast. Henley Rd, Oxford, OX4 4GX — 782 yards to the north. Unit 15, Kidlington, OX5 1RA — 1021 yards to the northwest. The Avenue, Oxford, OX1 5NZ — 1517 yards to the northwest. 60 Sandford Lane Unit 60, Oxford, OX1 5RW — 324 yards to the west. 1 Robert Robinson Avenue, Magdalen Centre, Oxford Science Park, Oxford, OX4 4GA — 1393 yards to the northeast. Church Rd, Oxford, OX4 4 — 231 yards to the north. Church Road, Sanford-on-Thames, Oxford, OX4 4YB — 240 yards to the north. Oxford Thames Four Pillars Hotel, Henley Rd, Oxford, OX4 4GX — 753 yards to the north. The Oxford Science Park, Oxford, OX4 4GE — 1391 yards to the northeast. Kennington, Oxford — 1325 yards to the northwest. Sandford Rd, Oxford, OX4 4XN — 1436 yards to the north. 4 janaway Sandford-on-Thames, Oxford, OX44SY — 1241 yards to the north. 5 Kirk Close, Oxford, OX1 5PX, — 1371 yards to the northwest. Oxfam House, Oxford, OX4 2JY — 184 yards to the east. Littlemore Park, Oxford, OX4 4FY — 1441 yards to the northeast. Oxford, OX4 4GX — 775 yards to the northeast. AG Palmer House, Oxford, OX4 4SU — 1592 yards to the north. 41 Henley Road, Sandford-on Thames, Oxford, OX4 4YW — 798 yards to the northeast. St Edmund Hall, Oxford, OX1 4AR — 1366 yards to the northeast. The Old School Building, The Avenue, Kennington, Oxford, OX1 5PP — 1220 yards to the northwest. Littlemore Mental Health Centre, Sandford Road, Oxford, OX4 4XN — 1346 yards to the north. Oxford, OX4 4 — 796 yards to the north. 65, The Heyes, Oxford, OX1 2BU — 1167 yards to the northwest.